Brazil’s foremost contemporary dance troupe returns to BAM for the 5th time with Bach & Gira, a distinctive double bill that showcases the company's breadth. 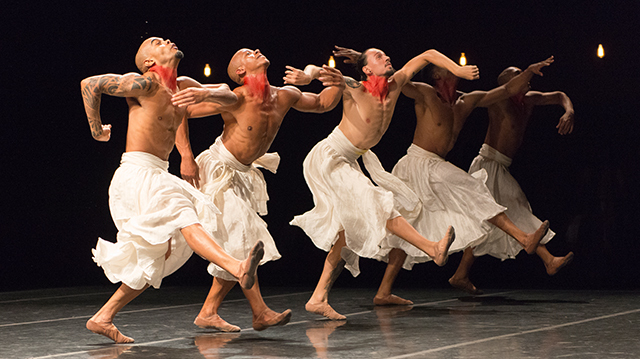 Like the company itself, the program foregrounds classical technique, traditional Afro-Brazilian movement, and a current choreographic language. Choreographer Rodrigo Pederneiras renders the baroque beautifully modern in Bach, set to Marco Antônio Guimarães’ interpretation of Bach. Then, the ensemble transports us to its home country with Gira, featuring a soundtrack by São Paulo band Metá Metá. Context is everything, so get even closer to the production with this curated selection of related content. After you've attended the show, let us know what you thought by posting in the comments below and on social media using #GrupoCorpo. Choreographer Rodrigo Pederneiras elaborates on what inspired him to pair Bach and Gira, how he selects musical collaborators for new works, and the ways his dancers blend contemporary and traditional dance techniques. What does opening night look like at the Teatro Municipal in Brazil? Witness the sweat and cheers in this behind-the-scenes peek at the dancers as they take on the demanding Bach and Gira. Bach & Gira marks Grupo Corpo’s 5th time at BAM. Explore the company’s previous work on the BAM Archives: 21 & O Corpo (NWF 2002), Lecuona and Onqotô (NWF 2005), Benguelê and Breu (Spring 2008), and Ímã & Sem Mim (NWF 2012). The composers of the music for Gira bring their unique blend of jazz, funk, and samba to the streets in La Blogothèque’s renowned series. What did you think? Tell us what's on your mind in the comments below and on social media using #GrupoCorpo. Every time I see Grupo Corpo is better -- they just get more confident, more spectacular. Anybody who misses this latest performance will regret it -- by FAR, one of the most important and joyous dance events in NYC in ages. Now I wish I could find the music --- hard to order on line. BAM should have been selling CDs! Second piece, Gira, was absolutely phenomenal! Gira was just amazing ! where can we find the music ? I found it on Spotify. You just type Grupo Gorpo and you will see it! Bach was great and Gira was absolutely gorgeous! The joy and energy from the dancers was contagious and I left Bam feeling like I should start dancing! There was no depth, no bredth, no beauty. It was not moving or inspiring in any way, and the music was just terrible. An a-climactic, nerve wrecking experience. I am very disappointed with Bam and am used to a higher standard from them. It's the kind of dance show that makes me reconnect with my own body, wanting to shake it and twist it for days and days after the show. It was very inspiring and exciting. I loved every second! I’m very glad that Bam gave me the opportunity to attend such a wonderful performance. Awesome!